Pension Pielmeier was pretty good but we had to mark it down because of the breakfast which included kraft singles-style cheese slices. You expect that in Australia but in Germany it’s not really good enough. Tough, yes but we need to be if we’re to retain the trust of our readers. There is a lot of water in the Donau. After leaving Deggendorf we encountered a number of ‘hochwasser’ signs (high water), where water was over the path. Some of these we ignored, resulting in wet socks and shoes. Some we could not ignore. We had one detour along the edge of a muddy field and another along the road. Arrived in Passau in time for morning tea before attending the organ recital in St Stephens Church (Bach, Tartini, Flor Peeters, Schutze). 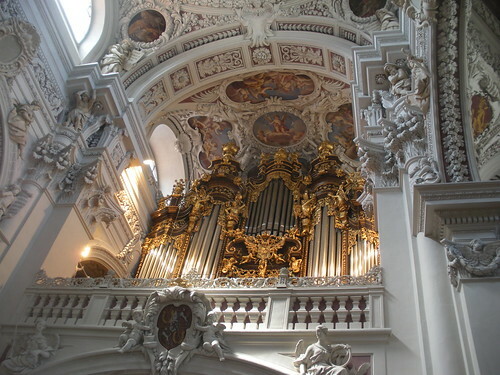 This church is thoroughly decorated in the rococo style with a high cherub count. This style is growing on me – I think it could inspire the next kitchen renovation. The Inn River enters the Donau at Passau adding more water to the torrent. The river flows through a forested gorge from Passau to Aschach making this a spectacular section of the route, especially at Schlogen where there is a big bend. There are gasthofs, restaurants, pensions and all kinds of facilities for the hundreds of cyclists. But the route is not overcrowded. We have seen people of all ages, including small children, cycling the radweg. Child trailers are common – one carried a dalmatian! We have noticed the beautiful palette of pastel colours of buildings in the towns we pass through and believe that this must be the result of some kind of regulation. It seems unlikely that it could occur by chance. Does anyone know if that’s true? As we dined by the river in the evening a man walked by with a falcon on his gauntleted arm! This entry was posted on 11 August 2010 at 7:29 am and is filed under Austria, Germany. You can follow any responses to this entry through the RSS 2.0 feed. You can leave a response, or trackback from your own site.